In January of this year Escape Studios, a London-based VFX academy, organised the VFX Festival held at the Vue Cinema at the prestigious Leicester Square, to give students, professionals and VFX enthusiast a place to connect. Escape Studios organises the event annually in combination with high end VFX companies and HP for a full on three days of showcases, panel discussions and Q&As. The first day of the festival was programed specifically for students, where several companies showcased their work, held Q&A sessions and gave future VFX artists a platform to learn, be inspired and to talk with professionals. The festival is a great initiative from the academy, and having a day programmed for students only allows them to attend the festival without feeling intimidated by professional festival-goers. It allows the next generation of compositors and artists the chance to learn, ask questions and discover what a career in VFX will bring them. Along with the chance to network and form friendships with other like-minded individuals with similar career goals. 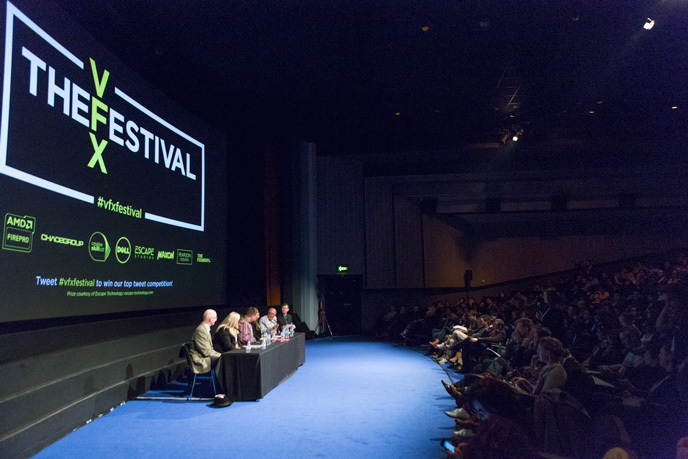 The focus on day two of the festival was about kick-starting a career in the VFX industry. Along with sessions from VFX Houses, compositors and artists all discussing their work and the satisfaction of doing what they love for a living, the festival also catered to those ready to begin working in the industry. VFX, Games and Animation studios discussed what it is they look for in new rotoscopers, compositors, and artists; along with the kinds of skills and qualifications that are needed. Discussion panels from ex Escape Studios students, Creative Skillset, The Mill, Bleed VFX, Double Negative, Territory, Nvizible and ILM all gave their insight and advice on how best to forge your way into the industry. Not being a student, I didn’t attend the first day, however the second day was an exciting one for an enthusiast like myself. Being greeted on arrival with a goodie bag, full of accessories and info from the many VFX houses attending, was a brilliant start to the day. I began my day at the exhibition hub, walking around the stalls. One notable exhibition booth was Hewlett Packard, filled with its latest technology and computers. They also allowed festival goers to play with a brand new 27-inch Cintiq. The hub was full of energy, with lots of smiling faces and excited people. There with a real buzz in the air. All around me I could see new partnerships and network connections happening. I was already having a brilliant time and the day hadn’t even started properly yet! The first session was from the BAFTA-award winning animation studio, BlueZoo. They explained how the company works and their focus in making animations for children. The company started as four friends coming together to create a small animation house in the heart of London. After twelve years, all their hard work has paid off and now the company has expanded to give staff members the chance to develop their skill-set further by directing shorts and other projects. Their high profile clientele includes Disney, Cartoon Network, Nickelodeon and the BBC, amongst others. It’s an inspiring story, and shows that anything is possible, if you work hard enough for it. The second sessions was from VFX and design studio The Mill, talking about the process of creating a photo-real CG orangutan, for their advert for SSE Southern Electric. The process involved gathering reference footage, studying documentary footage to see how orangutans move and relate to one another. The artists had to hand-sculpt wrinkles around the eyes, and face and try to match the reference material as closely as possible. The CG orangutan needed to interact with live action, so it was vital that it looked real within its environment. The second day finished with a talk from Framestore about their work on the hit film Guardians of the Galaxy. The session featured behind the scenes footage and discussing the process behind creating so many unique alien creatures for the film. Including the post-production pipeline and collaborating with other VFX houses working on the film. 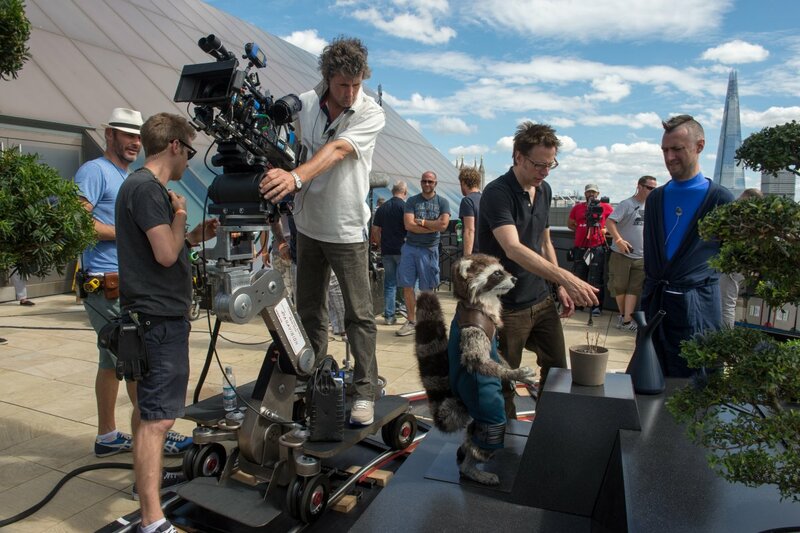 Rocket the Racoon stand-in on set of GotG (source: Marvel). However, the majority of this session’s discussion was about the creation of Rocket, the wise talking raccoon from the film. The Framestore artists walked us through the character pipeline in detail, explaining how they had to create new plugins, develop their own in house software to get the most realistic performance and looks. After an evening processing all the information and jaw-dropping work in the industry I’d seen the day before, the third day followed with a rested brain after a good night’s sleep. Day three focused on those already working in the industry, with working compositors, animators, VFX and CG artists mingling with enthusiasts like myself and recent graduates. The day’s first session was from Nvizible, giving a fresh view on VFX for indie and lower budget films. 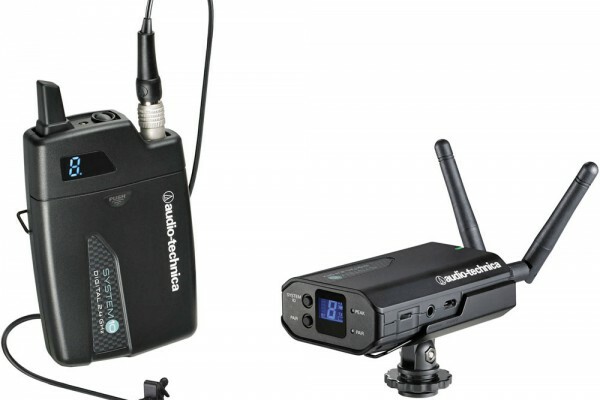 It comes as no surprise that VFX is an expensive part of filmmaking and for indie filmmakers, finding a way of implementing and funding high-end VFX into micro-budget films can be a struggle. Nvizible talked about ambitious VFX budgeting and how to begin planning your project’s VFX right from its earliest stages, in order to to keep costs low, so that when the time comes you can afford the post production look that you want. It may involve crowd-funding your post work or employing student VFX artists needing experience, or even learning how to use the free version of Nuke, or Blackmagic Design’s Fusion 7 (also free to use). 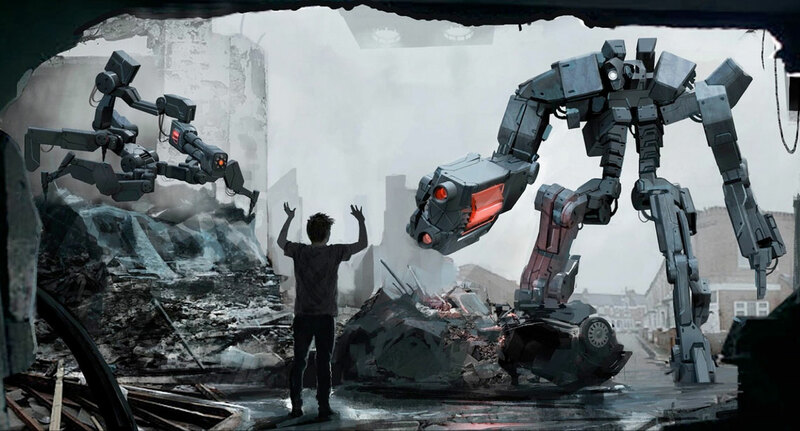 “Robot Overlords” concept art by Paul Catling. The film Robot Overlords was used as example of ambitious VFX budgeting. The team from Nvizible explained the process and the unique pipeline used in this indie film. They also explained how their new technology helps filmmakers in the form of Ncam. A software that allows crew members to see the real-time view of the set including the CG effects and characters already made. It was a very inspiring and motivating presentation about how creative input can get you the finished product you want, no matter your budget. Cinesite followed with a talk on how they did multiple small shots for Edge of Tomorrow and Hercules. Although only doing one shots can seem like a small amount of work at the time, in the end it actually turns out to be quite a large amount of work done for the finished film. Eamonn Butler, head of Animation at Cinesite, was an entertaining speaker. His insight and abundant experience had many festival goers glued to his every word. He delivered a great presentation and exciting view into the VFX industry. Butler also took part in the recruitment panels at the festival, teaching newcomers how to find a career in the VFX industry. 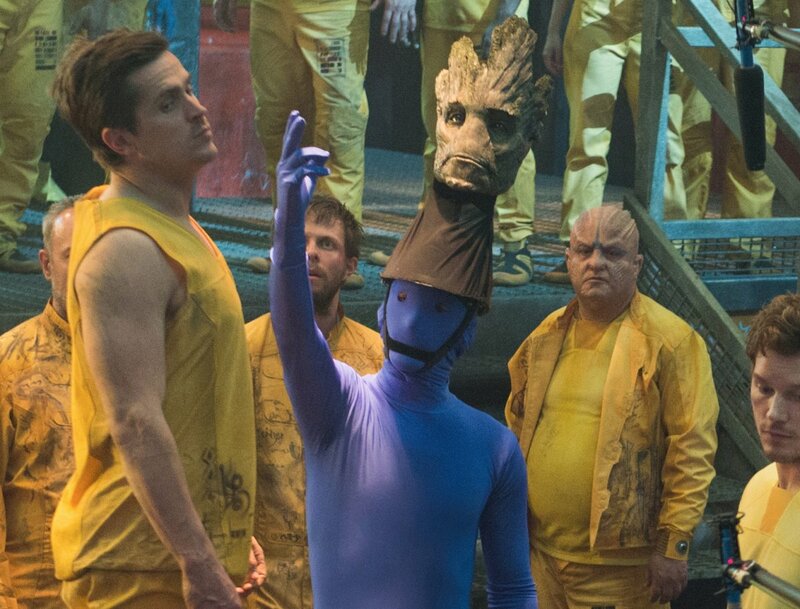 Polish actor Krystian Godlewski on set of GotG wearing a motion capture suit to record the character’s physical cues, later adding the finished CG Groot by MCP (source: Marvel). MPC were next up and followed on Framestore’s session on Guardians of the Galaxy, discussing the creation of Groot. The focus of this session was how to work in collaboration with other companies, along with the creation of a fictional character from scratch. They day finished with VFX powerhouse Double Negative and their work on Interstellar. Paul Franklin, Visual Effects Supervisor from D-Neg brought along pictures from behind the scenes and stories from the set to entertain us all. It was an exciting, inspiring talk about how they tried to incorporate practical on-set effects with rendered VFX, to keep a realistic look for the film. Instead of green screening everything (like most films do), the filmmakers projected space around the spaceship. It was intriguing to learn how the use of old filmmaking techniques, with new and updated tech can give a fresh look to filmmaking and VFX. It was also exciting to meet the team behind Interstellar, who only a few weeks after the festival took out the 2015 Academy Award for best VFX work in a feature film. All in all, the VFX festival was an inspiring three days full of motivational presentations, discussions and networking. It’s a great chance to meet people, learn new techniques and technology and to be blown away by high-end VFX. Not forgetting the excellent goodie bags! I’m seriously looking forward to next year’s festival, to be inspired again by the ever changing and fascinating world of VFX. Lex de Vroomen graduated from the London Film Academy. After working in the film industry as camera assistant for several years, he now works with VFX company The Mill in London, UK. He writes script and works on his first break as writer/director.